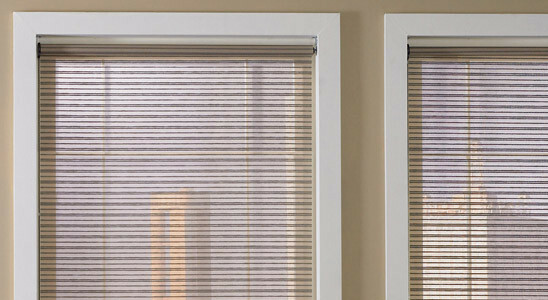 Décor offers window treatments from a variety of manufacturers to enhance the design and privacy of your home or office. Beautiful. Durable. Functional. Instinctively you know these are the things you want in a window treatment. With everything from the natural warmth of wood blinds to the simple, crisp lines of Roman shades, our design consultant can help you artfully unite your home décor with professionally-installed window treatments. And, by selecting your window treatments during your design appointment you’ll be able to start enjoying them the day you move in. The amount of privacy you desire will likely be determined by the particular room and view. If your kitchen faces a wooded lot at the rear of the home, you may not be concerned about privacy, while a bathroom window facing a neighbor’s home will likely need to be addressed. Like sunscreen protects the skin from damaging ultraviolet rays, window treatments protect the room interiors. Privacy: What type of privacy is needed? Light Control: What degree of light control does it offer? Function: Is it easy to operate? Is it energy efficient? Style: Will it complement your room and décor? Should it blend in or stand out?